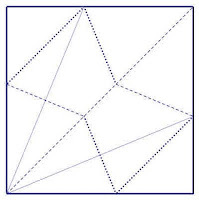 Another very simple origami project that can help spark mathematical conversations is the traditional envelope. Like the other simple origami projects that I've mentioned in previous posts (the jumping frog and the paper cup), the instructions for the envelope are available from the Origami USA diagrams page. This project is made with letter-sized paper (8.5 by 11 works great, I haven't tried A4), and is an accessible and appealing "practical" project (who doesn't like the idea of folding up a note so that it is its own envelope?). The crease pattern (at the top of the post) is a great potential source of math-themed conversation. Identifying the types of shapes (the envelope itself is hexagonal - a rectangle with two corners cropped) and finding their area (what is the area of the final envelope compared to the size of the original note paper?) provide some things to explore. Parallel and perpendicular lines, and a few 45 degree angles, make talking about lines and angles in the pattern accessible for younger students. The pattern is obviously symmetrical, but what kind of symmetry does it have? Many crease patterns that you might look at, like the paper cup (pattern below), have reflective symmetry. The envelope, on the other hand, has rotational symmetry (albiet a simple 180 degree rotational symmetry). Something else to take note of is the "handedness" of the finished envelope. If you are careful when you follow the instructions, you will end up with an envelope with a front that has its top left and bottom right corners cropped (which is best if you want to affix a stamp to the top right corner). 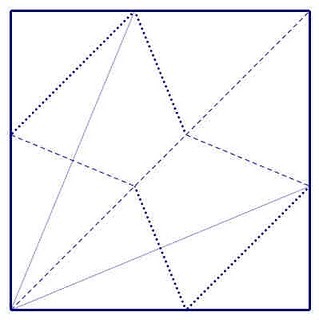 However, if you are folding the envelope by watching someone else or folding from memory, you are just as likely to end up with its mirror image, an envelope that has its bottom left and top right corners cropped. 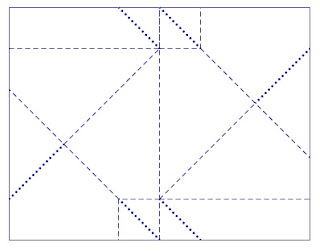 The envelope, like a many modular origami units (like Sonobe units) has a right-handed and a left-handed version - if you fold a certain way you get one orientation, if you fold another way, you get the mirror-image. 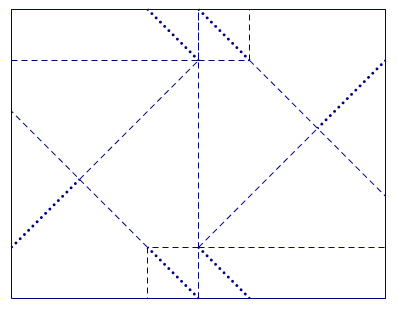 Which fold in constructing the envelope determines the orientation of the final model? Postscript: Some more playing around with this origami model here.